In User Top 10: 9 times. User Tracker Count: 28 times. This ride is kind of boring now. It used to be THE ride at Funtown. The only good thing about it now is the music. The theme of this ride used to be outerspace and aliens. All it is now is a predictable lightshow. The ride cycles are shorter too since they start the music right after the ride starts. The scrambler had good movement and the effects are very cool and well-done. Children may find this ride too intense, but adults should find it an exhilarating experience. This ride is a totally awesome experience. It combines an awesome light show with an above average scrambler. It&#39;s not quite as fast as Psychodrome but the effects here are a dozen times cooler than Psychodrome&#39;s ever were... and now Psychodrome has no effects anymore. Astrosphere is a must ride! I must say i really liked this ride. when i was like 8 or 9 i went to this park and towards the end of the day i rode it and wow it was the coolest thing ever. u got pushed back in your seat while it spun u over and over and over. Best scrambler Ive been on. The dome looks pretty good, but this always has a slow moving line thanks to the rides very low capacity and slow loading. However, the ride makes up for it as the scrambler alone was pretty good because it was quite fast and had some good laterals, but what really won me over was the incredible show which combined lasers, mist, music, and images. The collision effect also was really good on this scrambler and the cycle was very long. While we have closed for the 2007 off season we are already preparing for the 2008 season! New equipment, new effects and new paint are going to blow peoples minds. As the pseudo Special Effects Manager for the Astrosphere Im letting you know that I have lots of work ahead of me this off-season preparing our equipment from last season and repairing some of our old stuff that didnt work so hot last season. Im always looking for ideas, so hit me up. Check out the official Astrosphere myspace too! Now for my official review, The astrosphere, a flat-running dark ride was opened in 1976 at the time, and since then has undergone few changes, almost all of them effects-wise. The Eli-Bridge scrambler is an original, the 75ft. diameter vinyl dome is quite aged but still in great shape, adding to the mystery of just whats inside, while at the same time providing a wonderful "canvas" for the operators to paint with lighting effects and laser equipment. The soundtrack "Fire On High" by Electric Light Orchestra is a custom remix edited by the rides former owner an individual who is currently a park VP and director of maintenance. This soundtrack is pumped into the dome by a 6.1 channel truesurround sound system powered by Klipsch LaScala Speakers and a Klipsch subwoofer. Add to that a few dozen lighting effects and numerous Red, Green, Blue, and Yellow lasers, you have a ride that no other imitator can come close to. In 1992, a fire severely damaged the entrance to the ride including the custom control panel, dome, entrance tunnels, and some equipment. Some equipment on that side survived and still operates today, the dome was patched, tunnels rebuilt with fire protection systems, and the control panel was recreated. 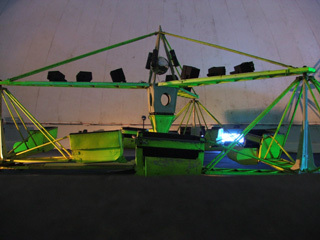 One of the unique features of the Astrosphere and quite possibly the most commented, was our array of 9 35mm slide projectors, mounted on and off the ride displaying space-themed images and other completely abstract things such as shapes and people. These unfortunately have been in service for such a long time that they no longer function properly and have been permanently removed. However, every now and then a stray projector finds its way into the ride and a loaded carousel of awesome slides. As I said before, Im looking for YOUR ideas because you are the people who make us the best. Hit me up on myspace and let me know your thoughts, ideas, comments and complaints. If you have questions, I can answer them! It was a pretty good experience (probably would have been better for someone on acid or stoned, man). The freaky guys face that kept showing up on the ceiling was creepy. I enjoyed the music, unfortunately I didnt get the smoke effect. I was informed that ingredients had run out before I arrived over Labor Day weekend. First I will start with a confenssion I rode this because I figured the only way it got this high of scores is because of all the "homers" who review it. After riding it I was pleasantly surprised. My ride operator Danny did a fantastic job with his intro in the opening tunnel and put up a great show. The slightly slower scambler did not bother me since if it went too fast you couldnt see the show which would make the ride pointless. I do recommned repainting the wall of the dome and definately the scrambler itself. Other then that dont change the ride, pure rough looking fun and I will give it a nine since I had such a fun time. 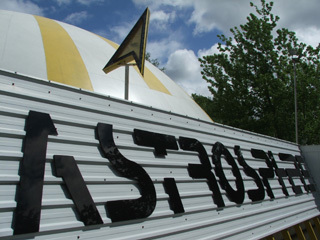 The Astrosphere at Funtown U.S.A., is one of the best scramblers ever! First, the ride is located near the Galaxi, making it easy to find. You cant miss this ride, as its located in a massive, yellow and white striped dome. I think that the dome could use a new, fresh coat of paint, but I dont mind, because its not whats on the outside that matters, its whats in the inside. Funtowns Astrosphere has a fairly nice sign, that gives it a space feel. The lines for the Astrosphere usually arent too bad, as they usually are 20 minutes or less. To board the ride, you enter an enclosed tunnel, also themed to space. I am not a big fan of the tunnel, because it can become cramped, and the Astrosphere operators tell you to lean against the slanted wall. Many people usually bang their head against the wall, and it hurts. Then, you can board your car on this excellent scrambler. This scrambler is a normal Eli Bridge Co. scrambler. Unlike Canobies Psycho Drome, this scrambler loads very quickly. Before the ride begins, the scrambler appears to be lime green, because of a light. Once the Astrosphere begins, you are dazzled by the best indoor light show ever! It is even up there with EPCOTs Illuminations! There are many lights, and sounds, that greatly enhance the ride experience. 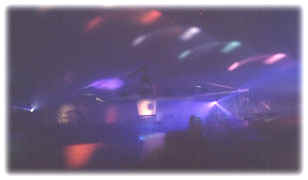 For sights, there are strobe lights, images of faces and items, and other projected items or lights. Best of all, the operators can control, so they can make the ride better and better every time! For sounds, you hear the song Fire on High by Electric Light Orchestra. Unfortunately, this is a slow scrambler, and I prefer fast scramblers like Canobies Psycho Drome. I do understand, that the Astrosphere isnt fast, so that people can enjoy the best light show ever. However, the Astrosphere is still a great ride. Overall, the Astrosphere is my second favorite scrambler, behind the Psycho Drome. This is a "Cant Miss" ride at Funtown U.S.A. I recommend this ride to anyone who enjoys scramblers, or wonderful light and sound shows. Do not bring children on this ride, that are afraid of the dark, afraid of some-what scary images, and afraid of strobe lights. UPDATE! UPDATE! As an operator Im giving you an idea of how much cooler it has become. First off, the ride is faster. Yes, after all these years we finally convinced the powers that be to give it a boost. So to those who didnt like it slow, your wish has been granted, but to those who liked it the way it was, fear not,its still slow enough for you to enjoy the show. Second, in case it wasnt mentioned, we now have nine lazers on the ride, giving it a super cool look. If you want to see them in all their glory, visit the ride at night, when fog is in use. Third, weve just begun training a new guy, hes doing extremly well. Im now proud to call him a bubble boy. Even better, he used to be an EMT, so feel free to injure yourself, hell know how to help you. Fianlly, thisll most likely be my last review of the ride as an operator, I highly doubt that I shall return next year. Lets just say that some of the powers that be dont see eye to eye with yours truly. 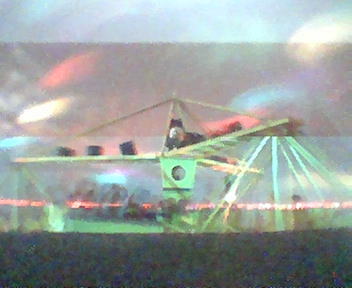 I will say this: everytime I did a show on that ride, I felt free. It was my work of art and it was a privelage to present it to all of you for the past three years. I hope that an impression has been left so that I dont become one of the forgotten Astro workers. Take care all, continue enjoying the greatest ride ever conceived by man. I hope its still popular in another 29 years. Thank you for riding, have a great day!